Mine Safety Agency Reports Failures Before Deadly Explosion : The Two-Way But it said its failures did not directly contribute to the blast, which killed 29 coal miners in 2010. 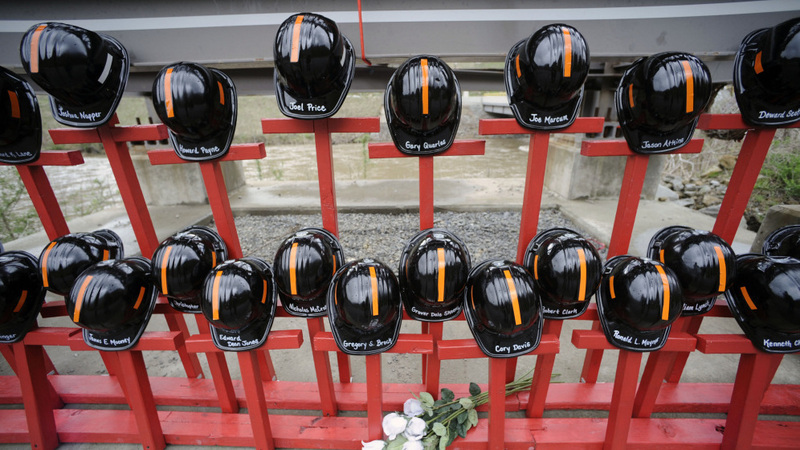 Mine helmets and painted crosses sat at the entrance to Massey Energy's Upper Big Branch coal mine on April 5, as a memorial to the 29 miners killed there one year earlier. The latest federal review of the 2010 Upper Big Branch mine explosion again blames Massey Energy for the deaths of 29 coal miners and says Mine Safety and Health Administration (MSHA) failures did not directly contribute to the blast. But details of those failures in MSHA's internal review show that federal inspectors, supervisors and administrators failed to identify some of the specific safety problems that triggered and failed to control the initial methane ignition and then caused it to mushroom into a massive explosion. The inspectors, who go underground to spot deficiencies and write citations, were dedicated to the health and safety of coal miners, the review says, but were "at times limited by their inexperience, inadequate direction, training, and supervision." The report blames a lack of resources triggered by budget cuts during the administration of President George W. Bush for leaving MSHA and its inspectors unprepared to adequately monitor and regulate a vast mine like Upper Big Branch and a company like Massey with persistent safety violations. Recommendations following a 2004 inundation of explosive methane gas at the mine, which was similar to the smaller methane leak that is believed to have started the Upper Big Branch explosion, were not retained in MSHA files and were not passed on to new managers in the MSHA district responsible for the mine. The mine's plan for ventilation did not take that 2004 inundation into account. Proper ventilation underground could have helped dissipate a methane leak. Inspectors also missed dangerous accumulations of explosive coal dust in the mine, which are blamed for turning what should have been a small ignition of methane gas into the deadliest mine blast in 40 years. Inspectors also failed to sample the mine for sufficient application of rock dust or crushed limestone, which is used to neutralize coal dust. The review also says that staff shortages caused the agency to bypass special investigations of persistent safety problems at the mine, including whether Massey officials knowingly violated safety standards. Inspectors also neglected to use Massey's own records, which are available for MSHA review, to spot hundreds of hazards that were not corrected by the company. "But those violations were not caused by MSHA or MSHA's inspectors," said George Fesak, the leader of the agency's internal review team. "They were caused by Massey Energy...I don't really see where we caused that explosion." Still, "the responsibility runs from bottom to top," says Davitt McAteer, a former federal mine safety chief who conducted an independent investigation of the Upper Big Branch explosion. "You have an overload of the system," said McAteer. "You have an understaffed district office. You have weak leadership. That's what the top management is supposed to look at. That wasn't done." Gary Quarles lost his son Gary Wayne in the tragedy and sat through a two-hour private briefing for the families of the victims. "I lay most of the blame on MSHA and the state for not doing their job to protect these coal miners," Quarles said after hearing the details of the review. "MSHA's got to do their job to make it safe for the coal miners nowadays." Rep. George Miller (D-CA), the senior Democrat on the House Education and the Workforce Committee, said the "entire system failed these 29 miners." He said some of the recommendations of the of the report should be considered by Congress soon. "The health and safety of America's miners must not be held up by predictable partisan battles," said Miller in a statement. The review notes that MSHA inspectors were busy at Upper Big branch in the 18 months before the explosion, issuing 684 safety citations that drew $1.3 million in proposed penalties. Still, the review says, "the Operator [Massey Energy] concealed its highly non-compliant conduct in a number of ways. Massey...violated numerous, widely-recognized safety standards," the report continues, "and failed to prevent or correct numerous hazards that ultimately caused the catastrophic explosion." But MSHA chief Joe Main acknowledged, "I don't think there's any question MSHA could have done better. I don't think there's any question that we surely plan to do better." Main said a number of corrections were already underway, including a more aggressive inspection process that targets problem mines like Upper Big Branch. Main said MSHA would now consider whether any agency officials or employees should be disciplined. United Mine Workers of America (UMWA) International President Cecil E. Roberts praised MSHA for undertaking the review. "There is clearly much work to do in order to bring the agency up to the standards miners have a right to expect, and I believe Mr. Main has identified what needs to be done and is on the right path. The UMWA stands ready to do all we can to help in that effort. But we also believe that it is incumbent on Congress to provide him with the tools he needs to get the job done." The internal review is the last of five reports on the disaster from state, federal, union and independent investigators. A federal criminal probe continues and already includes criminal charges against a Massey Energy foreman, safety chief and mine superintendant. Federal prosecutors have hinted they're considering charges against other company managers and executives. Massey was absorbed by Alpha Natural Resources last year. In December, Alpha agreed to a $109 million settlement, which keeps the company from facing corporate criminal charges. "The internal review released today documents a disturbing failure of enforcement by MSHA. A mine operator recklessly endangered the lives of its workers and federal enforcement officials failed to hold the operator accountable. According to the report, on numerous occasions safety inspectors identified hazards but did not demand corrective action, and failed to notice violations of the law. While the responsibility for this tragedy lies with Massey, any effort to enhance mine safety will not succeed if enforcement officials do not effectively do their jobs."